Cleaning gutters is a seasonal hassle that protects against other, much worse headaches later on. But what if this year—and plenty more years to come—you could skip the task altogether? Read on to learn how you can retire this tiresome task forever. As the days grow shorter and the heat of summer eases into autumn, it’s tempting to just kick back, relax, and enjoy this season of invigorating weather, game-day tailgating, and must-see television. Experienced homeowners, however, know all too well that the shift indoors doesn’t signal an end to outdoor maintenance. Fall is the time to winterize the lawn, replace weatherstripping, and make necessary house repairs before temperatures really take a dive. But topping the list of must-do tasks: the unpleasant duty of cleaning out your home’s gutters before precipitation starts to freeze. 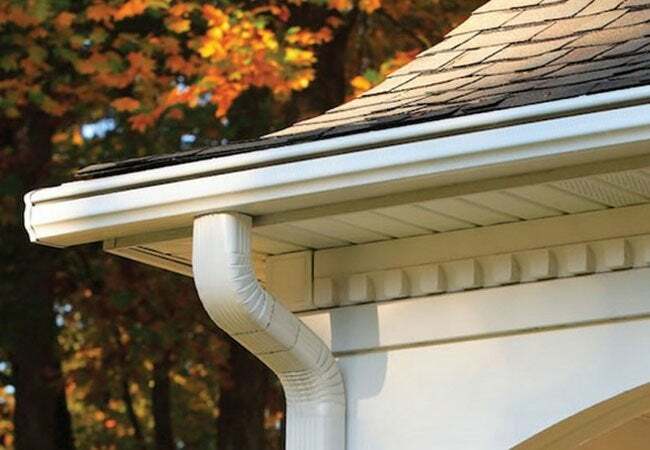 Gutters and downspouts perform the crucial function of channeling rainwater away from the house, preventing it from collecting at the base and seeping down between the soil and foundation. Particularly in areas that are high in clay soil, over-saturation at the foundation can cause the soil to swell and exert lateral pressure on the foundation walls, creating structural problems and increasing the risk of leaks. To keep this from happening, water must be able to flow freely through the gutters. 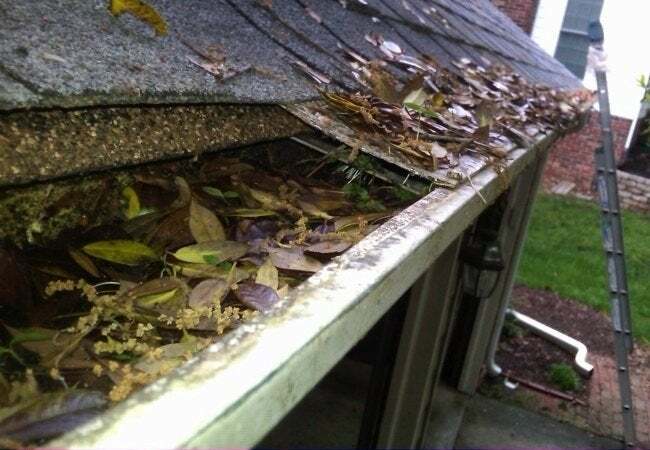 Unfortunately, left unattended for just a few months, typical gutters can become clogged with windblown seeds, leaves, twigs, and other debris that can obstruct drainage, cause rainwater to overflow, and prevent the system from doing its job. Even if you’re lucky enough to get through autumn without clogged gutters and their attendant foundation problems, stopped-up gutters in winter can bring even worse consequences. Moisture and standing water trapped by debris can freeze and expand, breaking the gutter and pulling it loose from its mounting brackets—and leaving you with an expensive repair bill. And as spring arrives and the debris decomposes, windblown tree seeds that settled in the gutters can sprout, growing into unsightly saplings that weigh down an already stressed gutter system. Within a very short time, the extra burden can damage the gutter. The sad fact is, if your home has traditional gutters, you can’t skip even one seasonal cleaning. The traditionally high-maintenance drainage system demands attention every spring and every fall, and possibly even more frequently if your backyard boasts an above-average number of trees. Regular gutter cleanup often comes down to two options: DIY versus professional. Handy homeowners who choose to tackle the chore themselves save money, but the labor is tedious and often unsafe. To minimize risk, gutter cleaning should be a two-person job, with one person on the ladder cleaning the gutter, and another down below holding the ladder steady and handing up tools as needed for scraping out or disposing of debris. To reduce the risk of falls, it’s imperative that the person tasked with the climb never stand on the ladder’s top rung or stretch past his or her natural reach. Ultimately, the safer route is to call in the pros. A reputable gutter cleaning company relieves you of the risk and responsibility and, equipped with the right tools and experience, can speed through the work quickly and effectively. But in the long term, spending a few hundred dollars on a professional service two or more times each year can really add up. Fortunately, homeowners aren’t limited to those two options. There’s a third way, a design solution that can eliminate the need for cleaning gutters altogether, no matter the season. The innovative LeafGuard Brand Gutters combine a hood and gutter into a single, uninterrupted fixture that does all the dirty work. The unique roll-formed design directs runoff from the roof into the gutter trough while simultaneously keeping leaves and other airborne organic matter out. This ingenious arrangement doesn’t allow anything into the gutter that would need to be manually cleaned, making maintenance a thing of the past. The rest of the system is built to work just as hard: The gutter trough and downspouts are substantial enough to handle even the heaviest rains, up to 32 inches per hour. 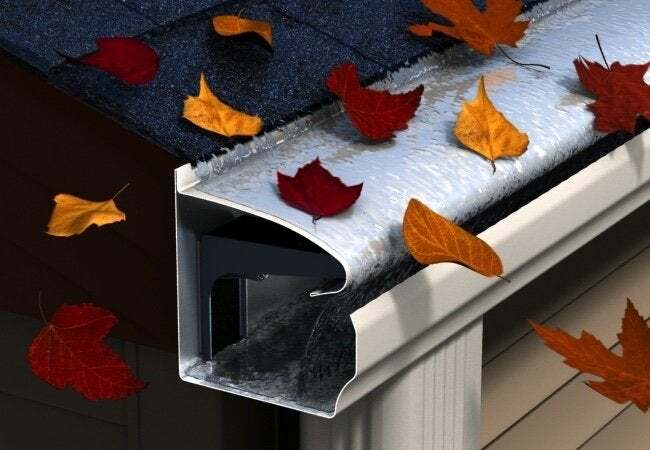 Plus, built from a continuous sheet of aluminum, LeafGuard is immune to those leaks that commonly develop where parts join together in traditional gutters. And, because they’re professionally extruded on-site from heavy-gauge aluminum prior to installation, you can be confident that the custom gutters will flawlessly fit your house. No guessing or piecing gutter sections together. No sagging or breaking. And LeafGuard gutters look as good as they perform, offering 12 scratch-resistant colors to choose from—including classic white, tan, gray, and even Musket Brown—so homeowners can find a style that truly complements their house’s design. Go ahead! Rake up the leaves on your lawn, caulk that drafty window, and change your furnace filters. But this fall, make a new plan. Instead of scaling a rickety ladder to clean your gutters, simply climb into your hammock for one last nap. When you choose LeafGuard, your gutters will flow freely, protected from clogs without your having to lift a single finger, and you’ll be able to cross gutter maintenance off your to-do list—forever.